Integrating televisions, sound systems and more outdoors! 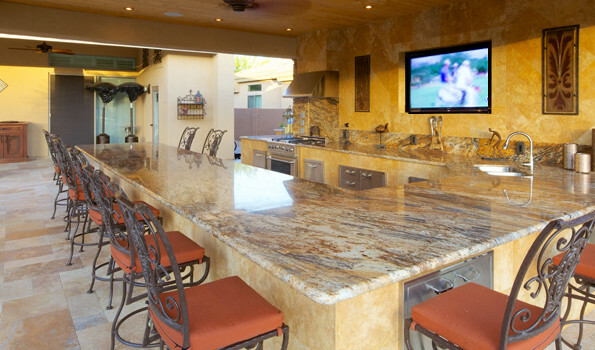 Technology in your outdoor living area adds to the social experience that you will share with friends and family. Your backyard is an extension of your home, so why not enhance your backyard with outdoor TV and music systems. With outdoor entertainment systems, you can make the most of parties, summer cookouts, and family time in the swimming pool, all while standing up to the elements for long-lasting audio and video entertainment. We are experts at providing you with the outdoor entertainment! We’ll design your entire video and audio system, incorporating it with your home automation system if desired and making it easy for you to customize your home entertainment system on every level. No weekend would be complete without music, movies, sports, and more, and we can make it a snap for you to enjoy the most advanced outdoor TV and music options available today. Just imagine watching the World Series outback while the kids swim in the pool. Or think of how great it could be to wirelessly stream music from inside for your listening pleasure around the fire pit. We can also add underwater speakers to your pool that transmit sound through water.